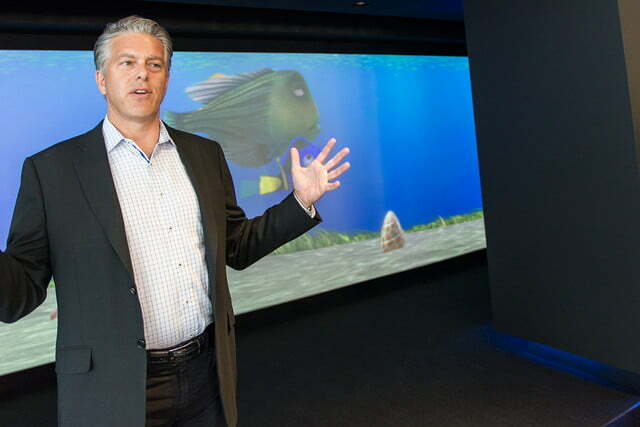 Nestled deep within Dolby’s discreet new San Francisco headquarters resides the greatest movie theater in the world. You wouldn’t know by looking from the outside, but nestled deep within Dolby’s discreet new San Francisco headquarters resides the greatest movie theater in the world. 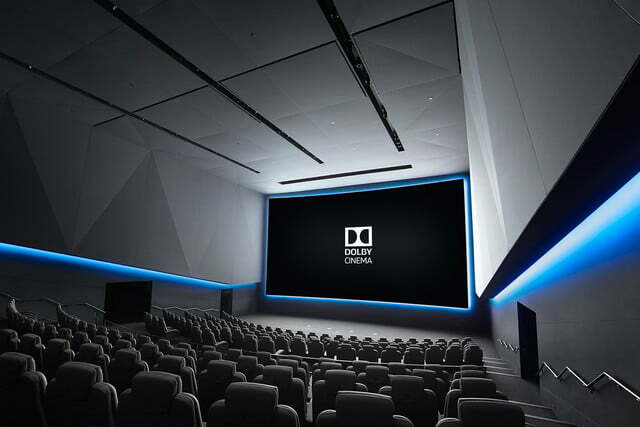 Built in less than two years during renovation of Dolby’s new building, and buried among some 100 laboratories, the theater boasts the absolute cutting edge of Dolby’s grand new vision that is repaving the theatrical landscape, Dolby Cinema. 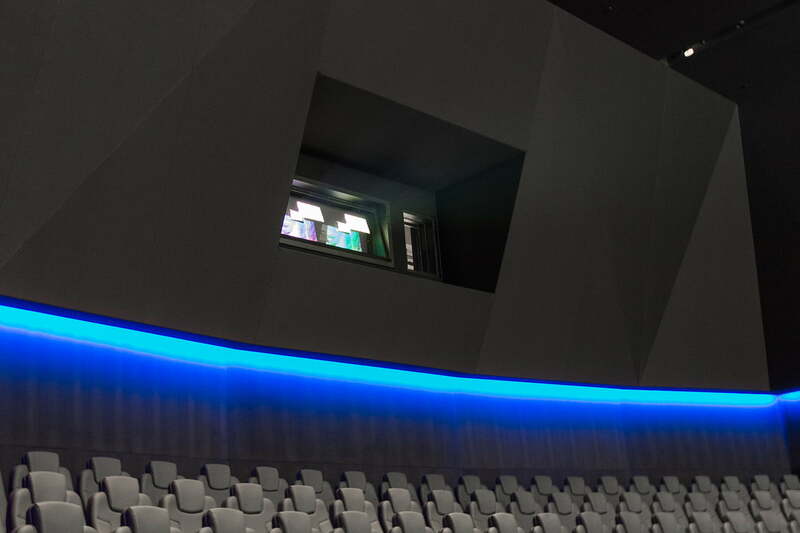 The new theater was designed to be the flagship of the company’s rapidly expanding Dolby Cinema fleet, capable of creating the brightest whites, the darkest blacks, and nearly a billion shades of color, all with dozens of speakers for explosive surround sound. The endgame: to totally dominate every other theater in existence. Last week, I was lucky enough to be one of a handful of journalists to experience the theater on its maiden voyage, and it was nothing short of spectacular. 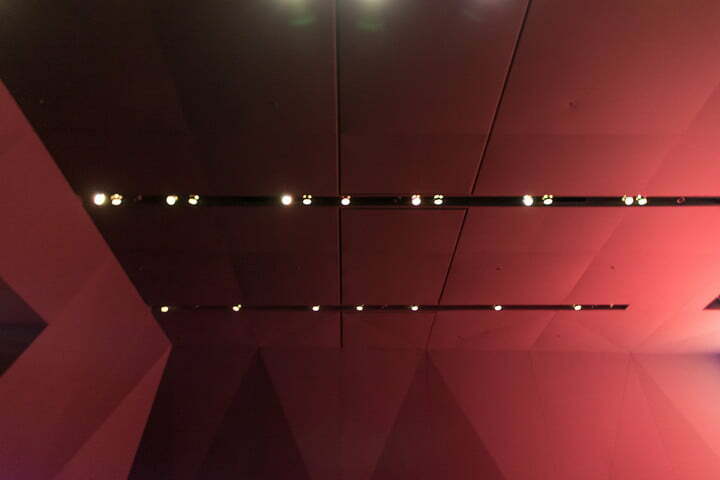 Dolby’s other-worldly venue enraptures you well before you arrive at the theater’s doors. 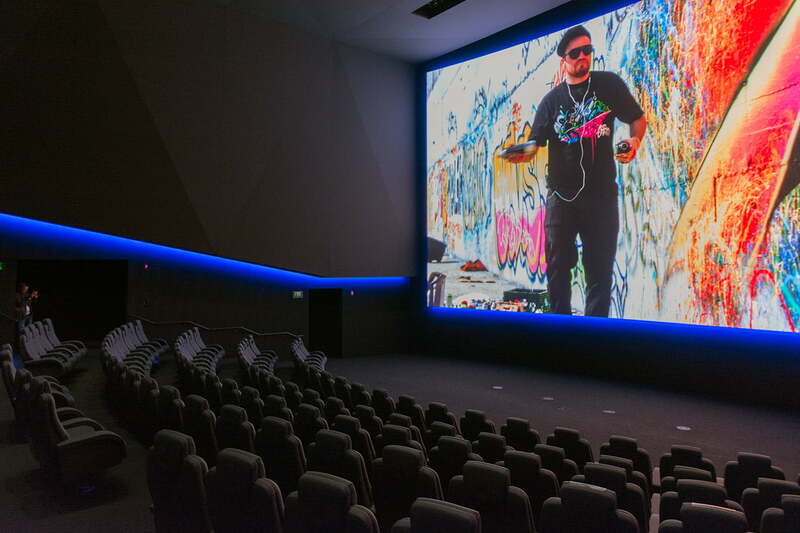 Instead of blank, carpeted walls and dim ambient light, Dolby paints your path with a wall-sized cinematic milieu of the featured film you are about to experience. You haven’t been seated yet, but you’re already in the film. 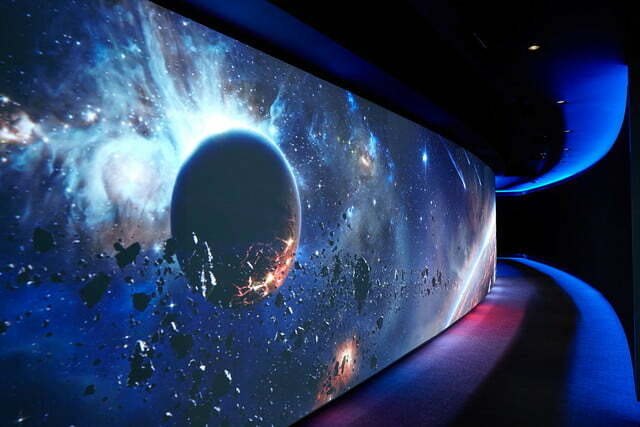 Walking through an airlock of automated doors, you’re greeted by a 50-foot wide screen, curved at the edges for an excellent picture from any angle, and outlined with Dolby Blue lighting to give a “floating screen” effect. The introduction is impressive – telling of the fact that every aspect of the theater’s design is aimed at providing an unparalleled cinematic experience. The walls are five feet thick, with 18 inches of air cushion for total isolation from outside noises; the color scheme is drenched in matte black paint for an ultimately dark room; the seats are curved and cushioned for an unfettered and comfy ride; the air conditioning designed to seep in below the seats so there’s no need for noisy compressors. 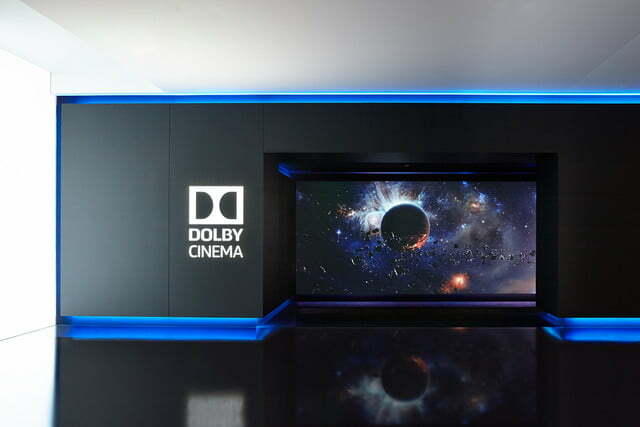 The real magic, however, comes from the two elements that power Dolby Cinema’s sights and sounds: Dolby Vision and Dolby Atmos. 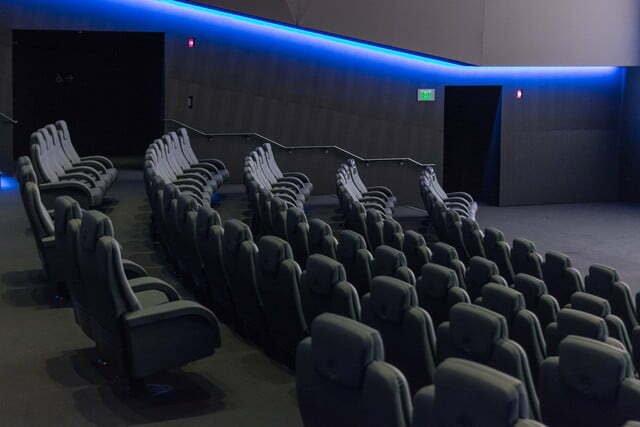 Every aspect of the theater is designed to deliver an unparalleled cinematic experience. Debuted in 2013, Dolby Atmos was the first audio system to incorporate “object-based” surround sound. For the first time in the history of cinema, movie makers could place sound objects – a passing helicopter, a buzzing bee, or a spattering of raindrops – anywhere they wanted to in a room, even on the ceiling. In this theater, the system is realized by 57 powered speakers anchored by subwoofers for a room-rocking surround experience with sound encompassing you like a dome. You can hear Dolby Atmos in any number of commercial movie theaters today, but Dolby Vision is much more elusive, and it’s this technology that will ruin you for lesser theaters. Powered by a pair of Christie Digital 6P 4K laser projectors mixed with Dolby’s special processing sauce, Dolby Vision is a bursting explosion of pristine white light capable of delivering up to 38 foot-lamberts of eye-scorching imagery. Along with a wide color gamut for nearly a billion available shades, Dolby Vision offers High Dynamic Range (HDR) for twice the peak brightness, and (more importantly) 500 times the dynamic range of standard theaters, creating the richest blacks you’ve ever seen on a silver screen. By the numbers, the contrast ratio of standard theaters often tops out at 5,000:1 or 8,000:1, but Dolby Vision achieves a claimed 1,000,000:1 contrast ratio. And trust us, once you go that black, it’s a real bummer going back. With so much room to work with in the way of depth, contrast, color, and sonic wizardry, it’s no surprise Dolby decided to pick an epic space adventure for our first ride in its showy new theater – a film that not only takes full advantage of all that Dolby Cinema brings to the table, but which also echoed Dolby Vision’s rise during its production process. That film is Disney and J.J. Abrams’ triumphant return to the Star Wars universe, The Force Awakens. From the nostalgic opening letter crawl, it was evident that this was going to be no ordinary re-watch. Utilizing Dolby’s unique 3D process, which uses two slightly different sets of primary colors to allow for the full color spectrum, the star-littered void behind the blue crawl created near-staggering depth in its inky blackness, ultimately looking more like a crystal-clear window than a projected image. From there, we road through a deluge of brilliant scenes. The bright and showy moments were stunning as they invaded the dark space; the bombardment of molten-red light from the surface of Starkiller base as it fired its Death Star-esque weapon was almost startling; light sabers gleamed against a white backdrop like flares on a snow-covered highway, and seeing the nuclear halo of sunlight bursting through the base’s window as the weapon charged felt strikingly similar to looking directly at the real thing. As much as the bursting spectacle enthralled, it was the finer details that heightened the experience beyond the realm of standard entertainment. The throngs of red lights adorning each panel and wall inside the First Order’s spaceships were sparkling rubies. Blast doors weren’t just metallic, they were cast in glinted pewter. Even subtleties like the golden highlights in Chewbacca’s fur, or the multiple shades of color on C-3PO’s breastplate captivated. Always, though, my eyes returned to the black of space which, set behind the swirling ships, stars, planets, and other flickering images, engulfed me in such depth and dimension, it was effortless to lose touch with the real world. Dolby Vision offers twice the peak brightness, and 500 times the dynamic range for the richest blacks you’ve ever seen on a screen. In fact, the only real critique I have for the theater has to do with the Atmos sound — and perhaps the lameness which accompanies my own advancing age. Just as Huey Lewis told Marty McFly in Back to the Future, Dolby’s sound system that night was, for me, just too darned loud! An easy tweak could bring things into balance there, and I was nevertheless entranced by the rolling waves of bass, and the pin-point accuracy all those speakers created. Perhaps the most telling result of my experience happened a few days later, however, when I went to see Denis Villeneuve’s Arrival at my favorite local cineplex. While the narrative was phenomenal, the medium was … distracting. Every “black” image, including the screen’s letter bars, cast a gray-echo of Dolby’s true black, robbing the brightest images of their punch. I went so far as to ask my friend, “Does this look like it usually does to you?” Alas, there was nothing wrong with the theater. It simply wasn’t Dolby Cinema. I could further extol the virtues of Dolby Cinema, but Dolby wanted to make sure you didn’t have to take my word for it. 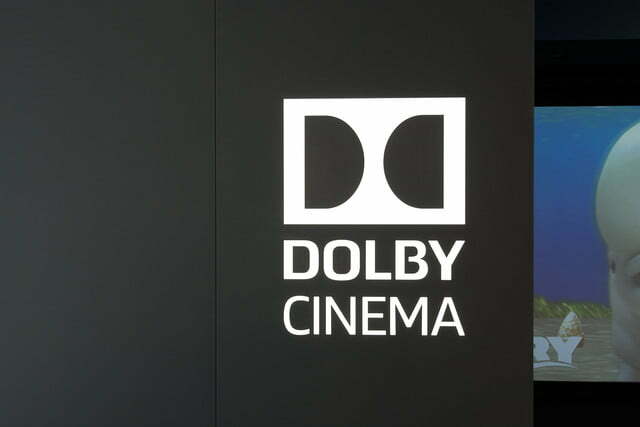 During a “master class,” Dolby touted testimonials from directors like John Favreau, Zack Snyder, and JJ Abrams, all gushing about the freedom Dolby Cinema provides, followed by stunning clips from effects-laden blockbusters like Inside Out and The Jungle Book. 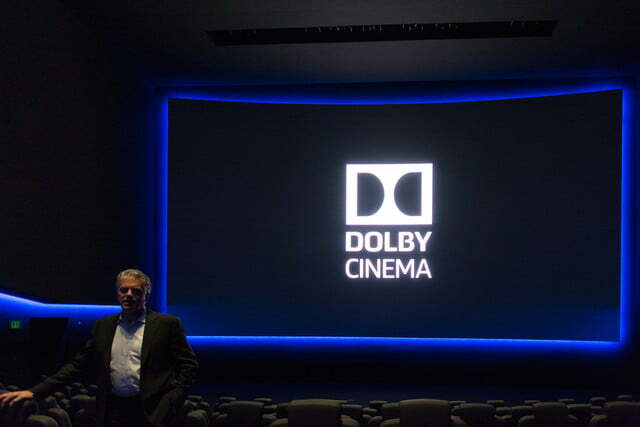 But it was during the theater’s official unveiling, just before The Force Awakens screening, when Dolby made its appeal for Dolby Cinema, courtesy of one of the film’s co-producers, Ben Rosenblatt. Standing on stage in front of the audience the jovial Rosenblatt told a cool story about his first Force Awakens experience in Dolby Vision, which he had with JJ Abrams himself. “It was in a nondescript, slightly shady warehouse by the airport,” Rosenblatt begins. 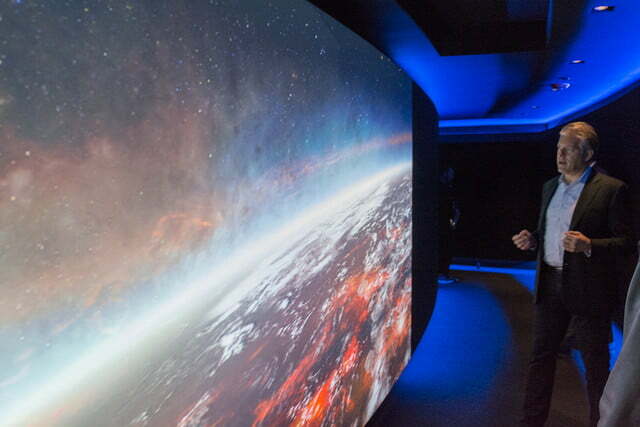 “One of the cool components of working on that film was that we were sort of working in parallel with this new technology,” Rosenblatt continued, explaining how the film’s production took place before the first Dolby Cinema theaters were built. “It was just this moment where we played this thing, and we saw all the images that we were just … obsessing over but, in an instant, they looked more incredible than we’d ever seen them before,” Rosenblatt said. “And it blew all of our minds because we hadn’t done anything … We simply played them on a different medium, and let a colorist take a pass at them. And it was such a cool moment because we were exhausted emotionally and physically from trying to get this piece out there … and then we saw the first example of how it was going to be seen, eventually, in the theaters — if (Dolby) built them! Of course, while Dolby Vision is, as the company says, quantifiably the highest quality format when it comes to sheer brightness and contrast, and Dolby Atmos is essentially the industry standard for top-quality surround sound, Dolby Cinema is not the only new format on the block. IMAX, best known for its grandiose theaters and skyscraper screens, has its own laser projection system. 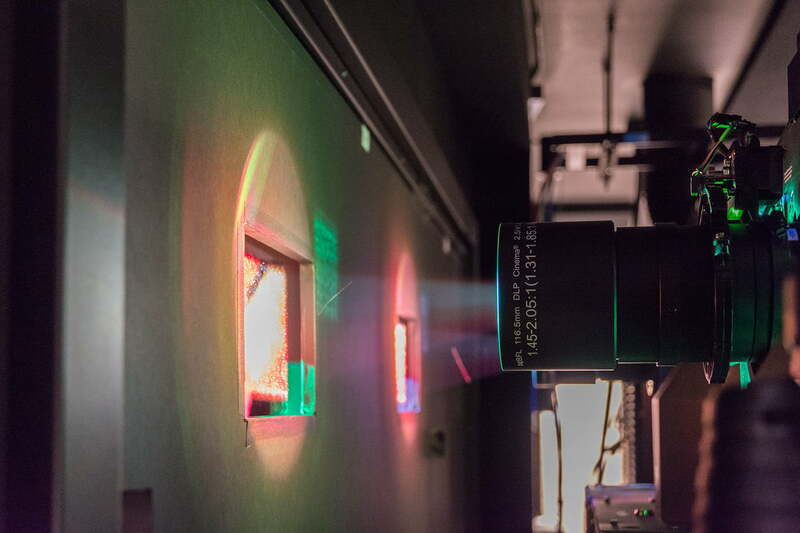 On the IMAX website, you can read about select theaters boasting dual 4K DLP laser projectors. Even though the projection system isn’t as powerful as Dolby Cinema (the theater’s industry-measured 22 foot-lambert system can’t match Dolby’s 38 foot-lambert projectors), considering that it is used for 75-foot screens and above, it’s no doubt a powerful cinematic experience. Seeing the nuclear halo of sunlight felt strikingly like looking directly at the real thing. Not so with Dolby Cinema. While you may not get the massive screen size, you’ll always get the audio/visual spectacle. Some readers may remember my first Dolby Vision experience at Hollywood’s illustrious El Capitan Theatre in 2015. Yet, even though the El Capitan has both Dolby Vision and Atmos in tandem, the grand old theater built in Hollywood’s roaring-twenties doesn’t meet the design specs needed to qualify as “Dolby Cinema.” Dolby uses three parameters to define a Dolby Cinema theater: Dolby Vision, Dolby Atmos, and the much more ambiguous “inspired design.” While the latter is certainly nebulous enough for skepticism, unlike IMAX’s many shades and sizes, you can count on the same audio and visual experience in every Dolby Cinema theater created. What’s more, Dolby Cinema is no longer a pipe dream reserved for journalists and millionaire film directors. It’s real, and likely available in a city near you. From a tiny sample of just five Dolby Cinema theaters in 2015, the number has now grown to 50. Dolby partner AMC Theaters has a standing order for a full 100 screens by 2017, while China’s Wanda theater group hopes to have the same number by 2018. If you love movies, or simply want to have your senses dazzled, I suggest you find a Dolby Cinema theater near you and have a ride. Take it from Mr. JJ Abrams himself: It’s gorgeous.